MAULDIN, S.C. (Sept. 25, 2018) – Maple Brook Terrace Retirement Community, a best-in-class, all-inclusive, resort-style retirement community, has broken ground in Mauldin, South Carolina, with an expected completion date of late 2019. Located at 150 Verdin Road, Maple Brook Terrace will include 133 thoughtfully designed apartments in a park-like setting, with a unique variety of exceptional amenities and services designed to support its residents’ physical, social, spiritual, emotional, and intellectual needs. Located within a town rich in history and close to nearby shopping and entertainment centers, the meticulously designed community will encompass approximately 150,000 square feet of living and communal space. Amenities will include 24/7 gourmet dining, friendly and helpful concierge service, weekly housekeeping, on-call apartment maintenance with all utilities included in an affordable monthly rent. Residents will also enjoy a wellness/fitness center, library/computer room, game room, chapel, private and casual dining rooms, coffee bistro, arts studio, reserved parking, theater, and beauty salon/barber shop – all conveniently located on-site. The community’s residential wings will be located on each of the three floors, and include spacious and modern studio, one-bedroom, and two-bedroom options. Modern, well-appointed kitchens boast white cabinets, quality granite countertops, and island bars, and warm wood-plank vinyl flooring with acoustic underlay and lush carpeting will work together to reduce sound for optimal comfort. 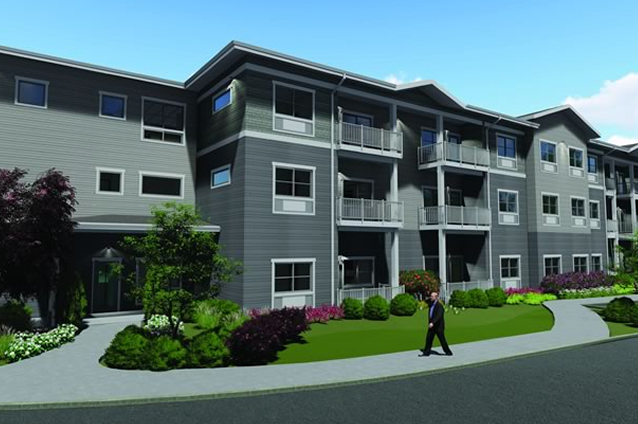 Most apartments will also feature private balconies for residents to enjoy the outdoor vistas. Maple Brook Terrace’s exterior design will blend traditional and modern elements to complement its surroundings. Brick accents, gable roofs, and differently patterned siding will combine to deliver rich and varied dimension. The entry, adorned with striking locally sourced brick columns, will open to a grand two-story lobby with coffee bistro and reception area. The interiors, inspired by boutique hotels, will be soft and welcoming featuring a grey palette with hints of diffused blue and yellow for a comfortable ambiance. With today’s more active senior in mind, the beautifully landscaped grounds at Maple Brook Terrace will be looped with pedestrian paths and surrounded by native trees, with raised garden beds for residents to practice their green thumbs. The grounds will also include a bocce ball court, horseshoes, a fire pit, and an outdoor gazebo to enable easy social interactions and exercise. For more information about Maple Brook Terrace Retirement Community, please contact Sarah Peters at (541) 323-5280 or sarah.peters@sunshineret.com. Based in Bend, Ore., Sunshine Retirement Living manages 21 retirement communities in 10 states, offering senior apartments, independent living, assisted living and memory care. A family-owned business with more than 20 years in the senior housing industry, Sunshine Retirement Living’s mission is to be the preferred senior living provider offering value, choice and independence while promoting health and social interaction that exceeds residents’ expectations and enriches the lives of both residents and staff. By providing meals, housekeeping, activities, transportation, utilities and in-house management staff, Sunshine Retirement Living continues to build an unparalleled community feeling in each property. For more information, visit www.SunshineRet.com or connect socially.